Sweet potatoes are one of my favorite vegetables. Get these 11 vegan sweet potato recipes to make your family dinners even more special. From curries to stuffed sweet potatoes, there is something for everyone. Do you love sweet potatoes? I do! I do! If you’ve been following along for a while, this is probably something you already know. Some of my most loved recipes on this blog are vegan sweet potato recipes such as this Sweet Potato Curry, Spiralized Sweet Potato Salad, and of course, the ever so popular Vegan Sweet Potato Casserole. 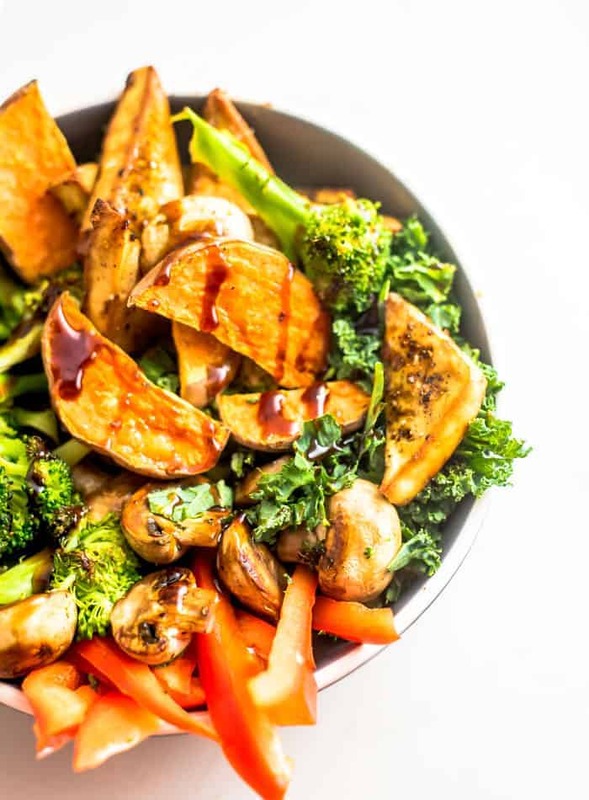 Sweet potatoes are not only an incredible base for your vegan dinner recipes, but they are also a food that is good for you! There are a variety of ways to cook sweet potatoes, as you will see in the recipes below. However, many of these recipes call for roasting the potato. Here are a few tips to consider when you are roasting sweet potatoes. Whether you are roasting them whole or in cubes, make sure your sweet potatoes are similar in size. This ensures that they cook evenly and thoroughly. Roast your sweet potatoes hot. I recommend at least 375 to 425F. Baking them at a higher temperature caramelizes the potatoes and brings out their natural sweetness. 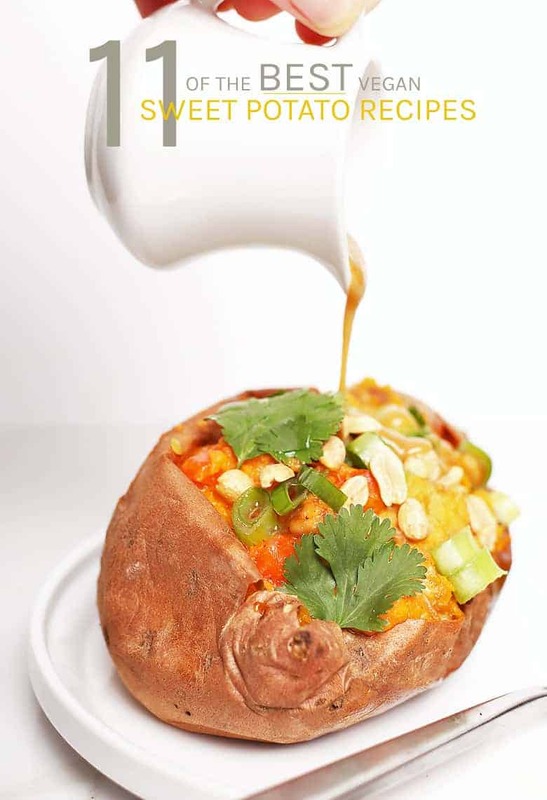 With a fork or knife, generously poke or slash the sweet potato before baking. This releases some of the moisture from the potato while allowing it to cook evenly all the way through. Turn or toss the potatoes halfway through the cooking process to help them cook evenly. 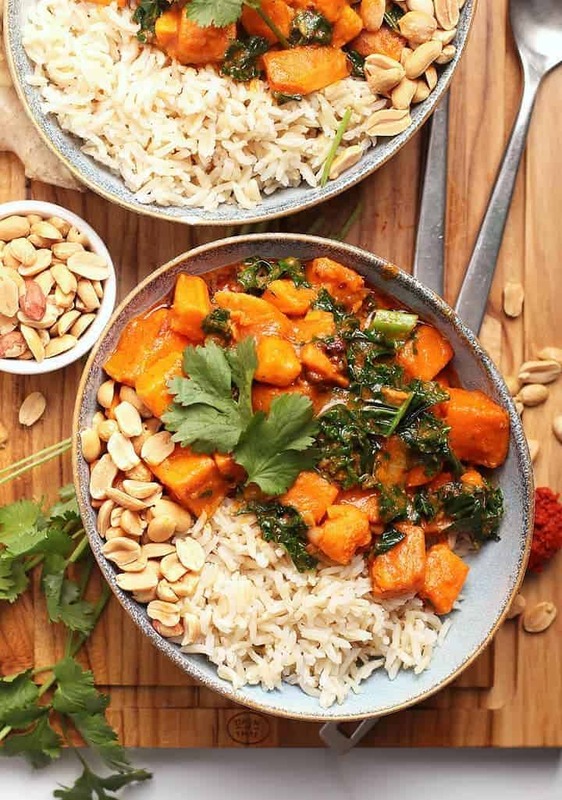 Now that we understand just how good tasting and good for you sweet potatoes truly are, let’s take a look at these 11 vegan sweet potato dinner recipes to get some inspiration tonight! A creamy Thai-style Sweet Potato Curry with Kale that is so quick and easy you can make it tonight! You’re going to love that this curry recipe is made in just one pot in under 30 minutes. Better yet, it is 100% delicious for a vegan and gluten-free dinner that everyone can enjoy. 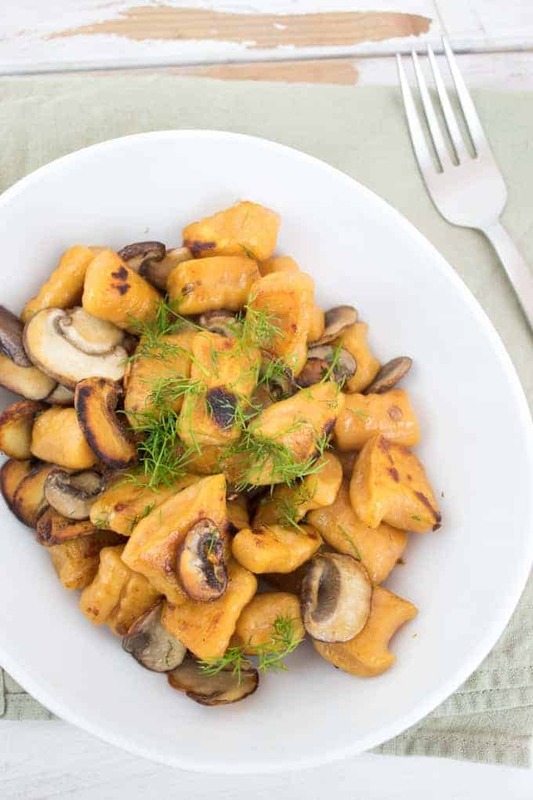 Make your sweet potato stand out with this incredible 2-ingredient Sweet Potato Gnocchi – just sweet potatoes and flour! Have you tried making homemade gnocchi yet? If not, I recommend starting with this no-kneading-required super simple recipe that looks truly divine. I love the combination of sweet potatoes and chipotle black beans and that’s why these Baked Taquitos with Sweet Potatoes are always a huge hit. 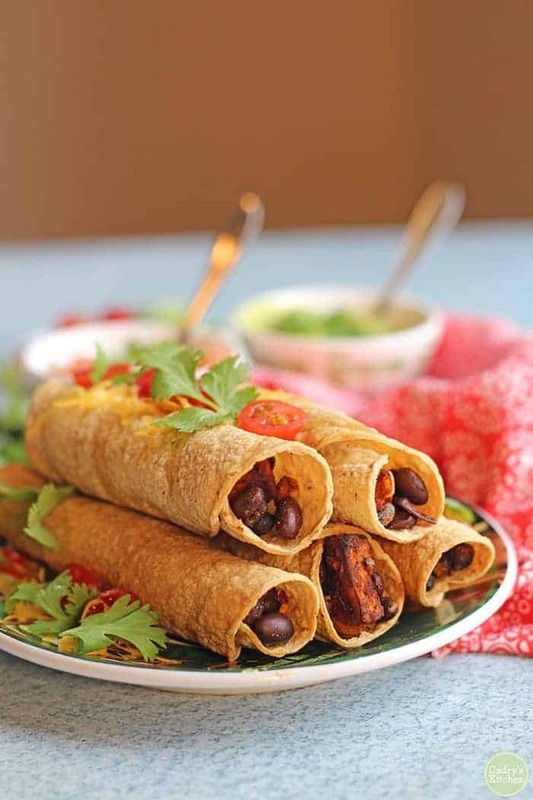 These taquitos can be made in an air fryer or the oven for a delicious meal of crunchy corn tortilla filled with a sweet and smoky center. So good! 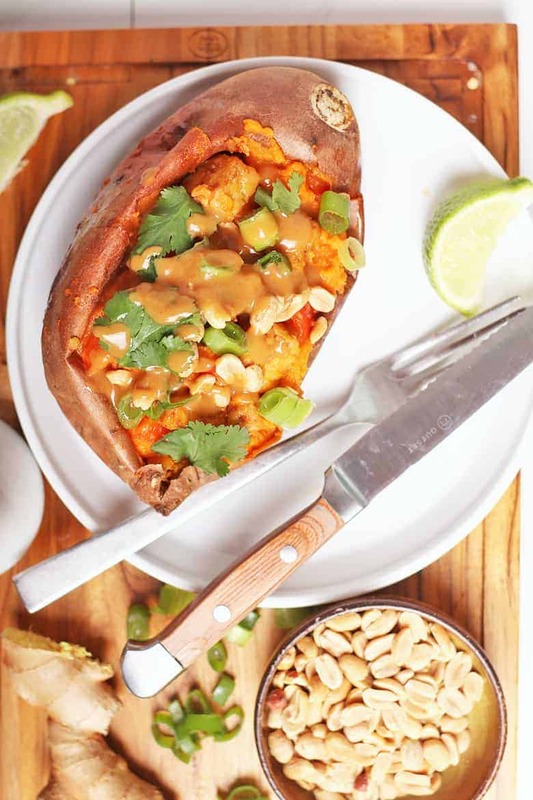 These Thai-Style Stuffed Sweet Potatoes are filled with Peanut-Ginger Tempeh, sautéed garlic and ginger, cilantro, and red bell peppers. Yum! Then they are topped with a Thai Peanut Sauce for a delicious vegan and gluten-free meal. It just doesn’t get much better than the marriage of Thai flavors and Sweet Potatoes. 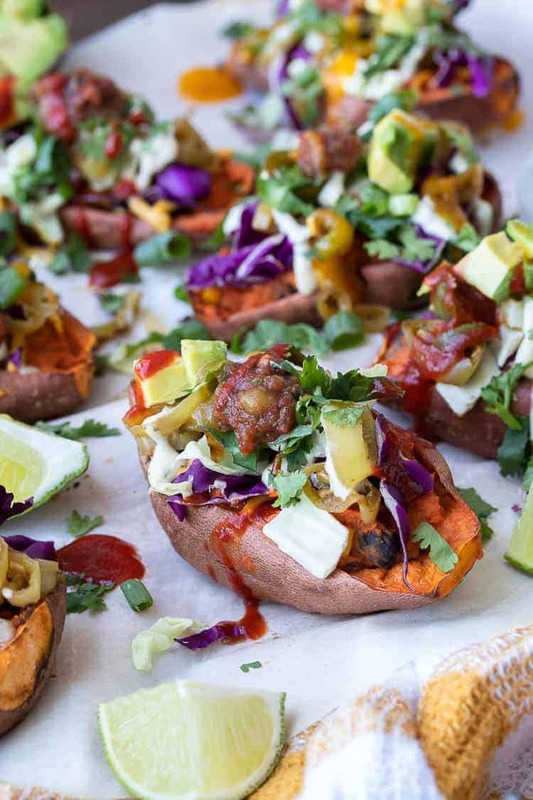 Not only are these mouth-watering Twice Baked Sweet Potato Skins incredible tasting, but they are also good for you! Made with whole, flavorful ingredients and topped with creamy avocado and homemade vegan cheese sauce, these sweet potatoes make the perfect quick and easy weeknight meal. My oh my, does this Sweet Potato Veggie Lasagna look good. 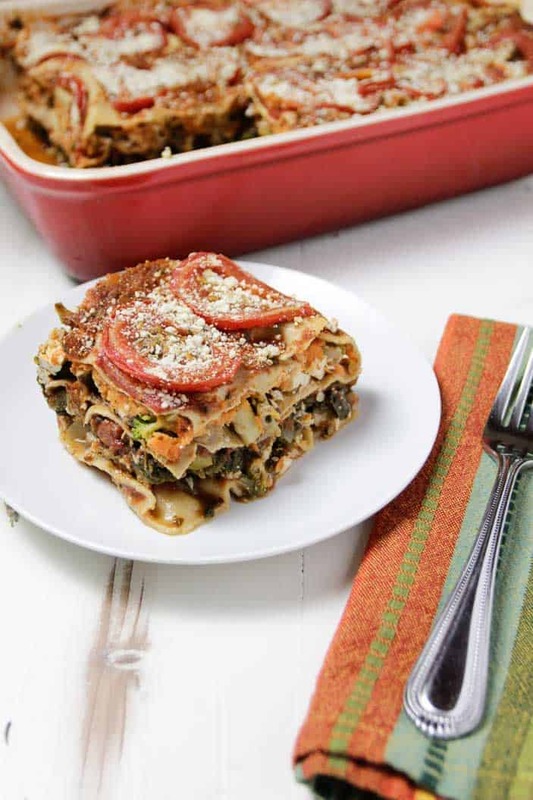 It’s a delicious layered lasagna filled with mushrooms, spinach, broccoli, and, of course, sweet potatoes. All topped with homemade vegan ricotta for a meal to get excited about. Share this impressive meal with your next dinner guests. I love anything in a bowl and so these vegan Sweet Potato Tofu Bowls are calling my name. Made with just 6 whole food ingredients, including broccoli, mushrooms, and red pepper, these easy-to-make bowls are a quick meal that is not only vegan and gluten-free but also high in protein and fiber and totally delicious! 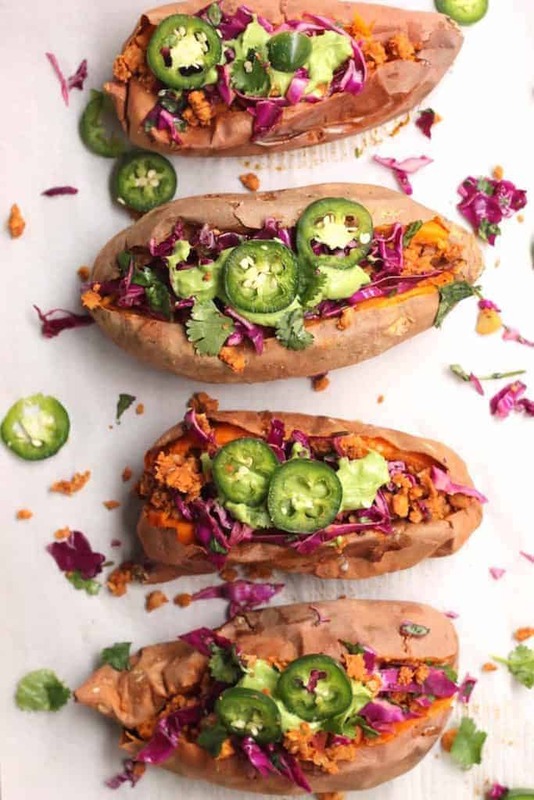 Take a look at these Taco-Stuffed Sweet Potatoes. Stuffed full of vegan chickpea taco filling, cilantro lime slaw, and cilantro lime crema, these vegan and gluten-free sweet potatoes are a delightful alternative to traditional tacos. Make these tonight for a wholesome and hearty meal. 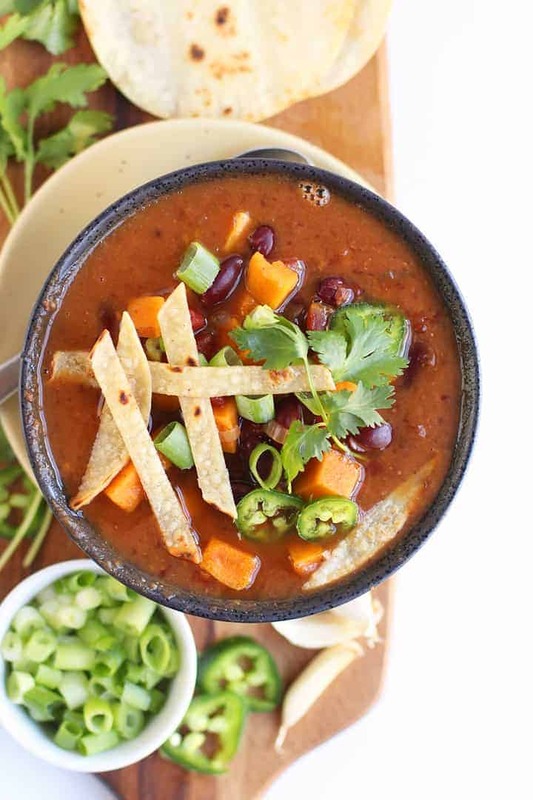 This Maple Bourbon Sweet Potato Chili is always a hit; it’s a sweet and spicy soup with a kick. This Sweet Potato Chili can be made in one pot on the stovetop or in under 20 minutes in your Instant Pot. Either way, you’re going to love the combinations of flavors in this sweet soup. 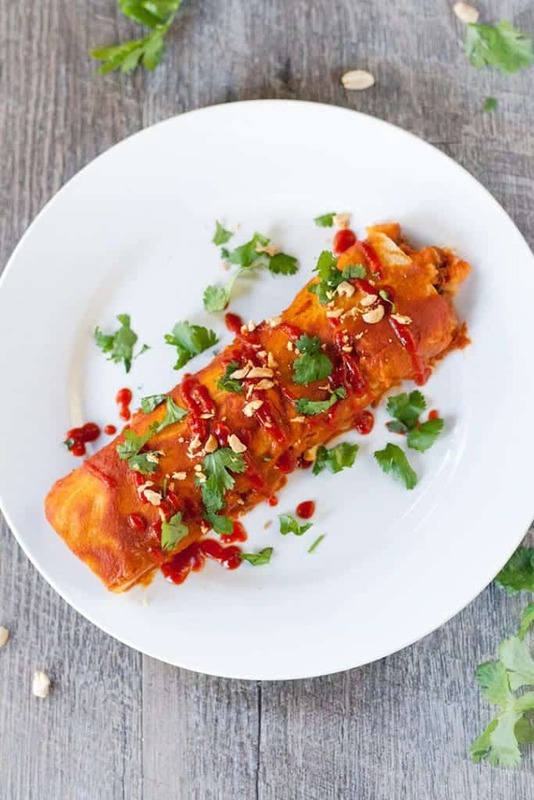 If I could have one meal for the rest of my life it would be enchiladas and these Sweet Potato and Peanut Enchiladas are definitely a good place to start! It may seem like a strange combination but I promise you peanut butter, sweet potatoes, and tomato enchilada sauce are a match made in heaven. Look at this beautiful Thai Sweet Potato and Carrot Soup. I love the vibrant colors! Better yet, this colorful soup requires only a handful of ingredients and tastes so so good! 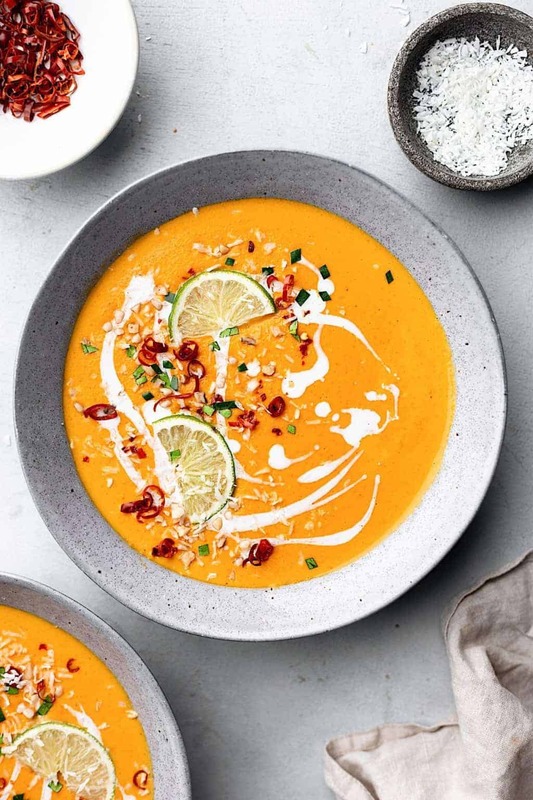 This sweet potato soup can be made ahead of time for an easy meal prep solution. Well, I think that’s all you need to know to make a delicious sweet potato meal. Let’s get cooking! If you give one of these recipes recipe a try, snap a photo and share it on Instagram. Make sure to tag @mydarlingvegan so I can see your creations!